Hazardous chemical storage needs to be stored in a proper chemical storage container, where it is fully compliant with all rules and regulations. Managing your hazardous chemical storage is very important and can decrease hazmat situations. Properly identify all of your hazardous chemical storage containers before placing in storage. When storing chemical drum containers, a proper DRUMLoc chemical storage building may be necessary. Chemicals should not be stored above eye-level, so that they can be evaluated when maintenance is taken. Maintain a proper inventory list with expiration dates. 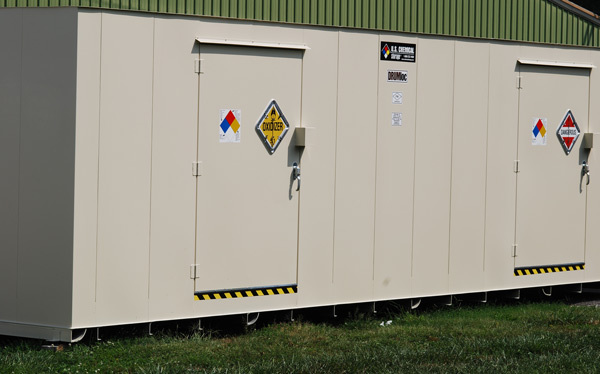 Keep your hazardous chemical storage in a fully compliant and secure chemical storage building. Extremely hazardous materials should be purchased in small volumes to avoid a hazardous situation. Lock your chemical storage facility when not in use. Fire extinguishers should by easily accessible. Do not store incompatible hazardous chemical together. Reading the label to the hazardous chemical is very important before storing. Proper research of the hazardous chemical can decrease hazardous situations. Label your chemical storage building so personnel is aware of what is being stored. When storing small containers, shelving may be a viable option. Make sure your chemical storage is maintained and compliant. Follow the steps above to make sure your chemical storage is maintained and safe. With a hazardous chemical storage building from U.S. Chemical Storage you can be safe and properly store your hazardous material. We offer a wide range of customizable accessories that meet all safety requirements and approvals including: OSHA, EPA, NFPA, FM Approvals and Warnock Hersey. 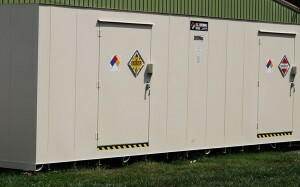 Keep your chemical storage safely secured with a storage building from U.S. Chemical Storage.